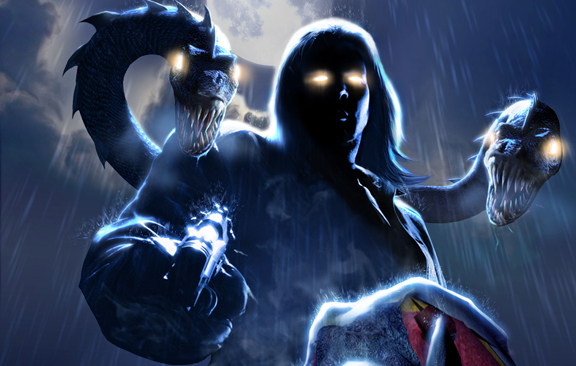 2K Games has announced the sequel to the 2007 cult-favorite shooter The Darkness. Taking the reigns for Darkness 2 from original developer Starbreeze is Digital Extremes, a supporting developer who has contributed to many high-profile 2K games including Dark Sector and both Bioshock and Bioshock 2. 2K did not give any reason for the change in developers. Returning to the story of possessed vigilante Jackie Estacado, Darkness 2 promises to break the FPS mold with a new “Quad-Wielding” game mechanic. Yes, you read that correctly. Jackie will have two normal, gun-toting arms and two demon arms that can attack, grab or, presumably, hold two more “darkness weapons” like those in the original game. Similar to the first game, there will also be mechanics that revolve around the use of light and darkness – in the original game, Estacado became more powerful depending on how poorly lit his surroundings were. 2K says that Darkness 2 will be ready in time for a Fall 2011 release. Unbelievable. Developer Gearbox Software announced this past Friday that Duke Nukem Forever will, in fact, see the light of day. Amazing as it is that DNF has a hard release date at all, what’s truly unbelievable about the news is how soon the game is being released. Duke Nukem Forever will be offending your mother on May 6th. Check out the announcement trailer for Civilization V. As of now, Civ 5 should be available for PC gamers winter 2010. Supposedly, the new game is going have a revamped combat system and more diplomatic options. Of course, you can’t see any of that in the trailer, but the video still looks pretty good.